Health Tips from Ms. Kennelly! It’s back to school time! One of the most critical things you can do to help get back in the saddle is reboot your mind and body! Here are some quick and helpful hints from our fabulous physical education teacher, Ms. Kennelly. 1.) 30 Minutes a Day! It is recommended that you have some type of physical activity that lasts for up to 30 minutes, for at least 5 out of the 7 days in each week. Your physical activity does not have to last for 30 minutes straight. You can break it up here and there throughout the day if you need to. Some great ways to incorporate a little movement into your day can be as simple as walking around mealtimes. Go for a walk for 10 minutes in the morning and in the afternoon before or after dinner. 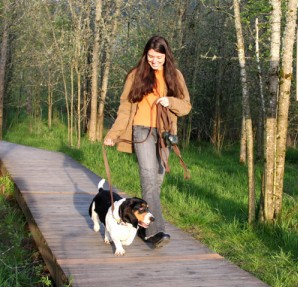 You’ll be surprised by how much extra energy you can gain from a quick walk! 2.) Recognize and Deal with Stress! Returning to school can be stressful for most people. It is important to recognize signs of stress in your life and develop coping skills to work through it. A good start to coping is learning to manage your time. You can easily develop a plan to distribute your workload evenly and avoid feeling overwhelmed. See your learning coach for help! 3.) Avoid Bad Snacks and Other Eats! Try to stay away from heavily caffeinated drinks (coffee) and energy drinks. These things will not help you, but may lead to a crash later on. If you’ve got a case of the munchies, try something natural like bananas and Peanut butter! It’s a great way to combine potassium and protein in a healthy way!